In Wisconsin, title to real property can be transferred from one party to another using a warranty deed. When recorded, a warranty deed conveys an interest in real property to the named grantee with full warranties of title. A warranty deed offers the most assurance of title. This assurance is greater than that of a limited or special warranty deed, which guarantees the title only against claims that arose during the time the grantor held title to the property, or a quitclaim deed, which offers no warranties of title. As defined in section 706.10(5) of the Wisconsin Statutes, a warranty deed conveys real property in fee simple to the grantee and contains covenants by the grantor that he or she holds title to the property and has "good right to convey the same land or its title." The grantor guarantees that the property is "free from all encumbrance" and that he or she will "guarantee and defend the title and quiet possession of the land against all lawful claims whatever originating prior to the conveyance" (706.10(5)). 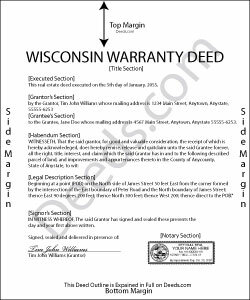 A warranty deed is recognizable by the terms "convey and warrant," but no warranties are implied in Wisconsin, so theses covenants must be explicitly stated in the deed (706.10(6)). In addition to meeting all state and local standards for recorded documents, a lawful warranty deed includes the grantor's full name, mailing address, and marital status, the consideration given for the transfer, and the grantee's full name, marital status, vesting, and mailing address. Vesting describes how the grantee holds title to the property. Generally, real property is owned in either sole ownership or in co-ownership. For Wisconsin residential property, the primary methods for holding title in co-ownership are tenancy in common, joint tenancy, and community (marital) property. A conveyance of real estate to two or more unmarried persons creates a tenancy in common, unless a joint tenancy is declared (700.18). All property of spouses acquired either individually or jointly during the marriage is presumed to be marital property unless otherwise specified by a marital property agreement (766.31). In Wisconsin, when a conveyance is presented to the Register of Deeds for recording, it must be accompanied by a receipt that evidences completion of a Wisconsin Real Estate Transfer Return. The real estate transfer fee is levied based on either the consideration made for the transfer or the current fair market value of the real property, as reflected on the form (77.22(1)). Submit the form electronically via the Wisconsin Department of Revenue website. All conveyances require a completed form or an exemption stated on the face of the deed. Find a list of exempt documents at 77.25. As with any conveyance of realty, a warranty deed requires a complete legal description of the parcel. Recite the prior deed reference to maintain a clear chain of title, and detail any restrictions associated with the property. The finished copy of the deed must be signed by the grantor and notarized. Additionally, the grantor's spouse must join in signing to release rights of homestead, regardless of whether he or she holds an actual interest in the property conveyed. Record the original completed deed, along with any additional materials, at the Register of Deeds office of the county where the property is located. Contact the same office to verify recording fees and accepted forms of payment. This article is provided for informational purposes only and is not a substitute for the advice of an attorney. Contact a Wisconsin lawyer with any questions related to the transfer of real property.